(May 19, 2015) EYSA teams left their mark on the 2015 Washington Youth Soccer State Cup series. Fourteen EYSA teams made it through to the championship matches in their respective State Cup tournaments, and exactly half took home championship trophies. Five of those championship teams were just added to the State Cup record books in May, while two took their Founders Cup trophies home after their seasons wrapped up in February. As it turns out, 1998 was a strong birth year for soccer players in our EYSA area: Eastside FC's G98 Red took the GU16 state championship; ISC Gunners Select G98 took the GU16 Div 2 Presidents Cup championship; MIFC Force 98 were finalists in the same division; and on the boys' side, MIFC Whitecaps B98 were finalists in the Founders Cup in February. EYSA teams, however, were into the semifinals or beyond at all ages across the three tournaments, from U9 to U18/19. Following are the stories from our State Cup champions who wrapped up this month. Two Eastside FC teams also took championship titles in the Presidents Cup, the most competitive State Cup tournament for their age groups. Eastside FC's G04 Red, coached by Chance Fry, hoisted the championship trophy in the GU10 9v9 first division after defeating Crossfire Premier G04 Schmetzer 2-0 in the final. The two teams had faced each other earlier in bracket play, resulting in a 0-0 standoff at Crossfire's home field. Amazingingly, the EFC side didn't allow a single goal the entire tournament, and scored 9 as they went undefeated four straight matches in their advance to the title. Three Eastside FC G04 Red players topped the Scoring Leaders table in the division. 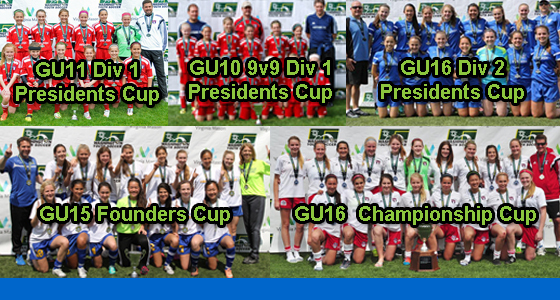 Lake Hills Infinity G99 took the GU15 Founders Cup championship May 10th. The girls beat NSC Spectre in a hard-fought final, 2-1, scoring in the first overtime period to avoid having to determine their team's fate in PKs. Coached by Justin Hunt, the Lake Hills team had finished fourth in the NPSL GU15 first division with an even record, 6 wins and 6 losses. They obviously peaked at the right time, however, managing to win 4 of 5 matches in Founders Cup bracket play to finish top in their bracket and earn a berth in the semis, which they won decidedly with a 3-0 scoreline against GFYSC. The win against NSC Spectre in the finals was even sweeter because the team had earlier handed them their only loss in the tournament during bracket play.